There is a charming simplicity about the Seychelles; the philosophy of locals is not to overcomplicate matters, and a charming escape to this tropical paradise is sure to purify both mind and body. Rest Of The World is rated 5.0 out of 5 based on 8 verified reviews from YGT customers. They played and stayed (we even checked they signed their scorecards). Complete personal service and the ultimate all inclusive attention is assured in the Seychelles, which is an exotic paradise that must be seen to be believed. 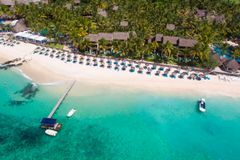 The highlight of the Seychelles is the 5* deluxe Constance Lemuria Resort, an epic complex that epitomises this amazing destination. Lemuria is where golf, spa, leisure and relaxation are fused in the most beautiful natural environment, and one that is surely the equal of any other worldwide luxury golf holiday delight.